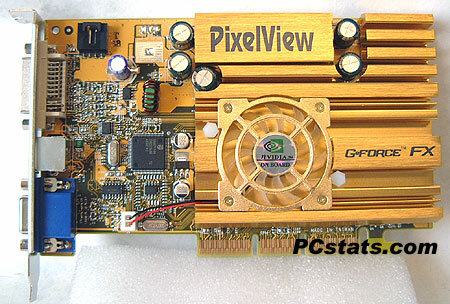 Based on DirectX 7 Hardware, the GeForce4 MX was closer to a GeForce2 class card then the DirectX 8 GeForce4 Ti's were. nVIDIA, being the smart company that they are, noticed this and you can bet that there's no way they'll make the same mistake twice. Enter the GeForceFX family of cards. It's nice and refreshing to see that all GeForceFX's are DirectX 9 compatible, not just the top of the line FX 5800/5900 class cards. That feature is probably the main reason why so many retailers tell me even the budget FX 5200's are selling well. Today we're going to be checking out not a budget FX 5200, rather Prolink's mainstream GeForceFX 5600 Ultimate Golden Limited 256MB videocard. Don't be fooled by the internal NV31 core code name, the GeForceFX 5600 GPU is slower then that of the NV30 (FX 5800), but faster than the NV34 (FX 5200). The Prolink GeForceFX 5600 Ultimate Golden Limited is probably the fastest stock clocked GeForceFX 5600 on the market right now, and comes equipped with a massive heatsink for looks. The speed comes thanks mainly to the faster TSOP-II Samsung 3.3ns DDR RAM which the card uses. 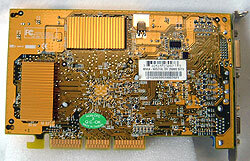 As you can see the Prolink GeForceFX 5600 is a small videocard, and it is covered by that massive heatsink. 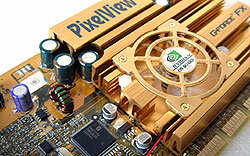 On the front, the GPU and four surrounding TSOP-II DRAM modules share one large heatsink. There are smaller heatsinks on the rear four DRAM. Of course there's more to the Prolink GeForceFX 5600 then big heatsinks (which make mediocre contact with all DRAM points in question) and faster memory. 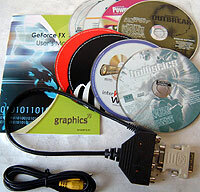 The card supports dual monitors and comes packaged with a DVI to analog converter. For those of you who dabble in multimedia, the Prolink GeForceFX 5600 Ultimate also includes a Philips 7114H VIVO chipset. To take advantage of that, Prolink have been good enough to includ the necessary breakout box which has S-Video in, S-Video Out, Composite In and Composite Out. The software bundle that comes with the Prolink GeForceFX 5600 is also pretty impressive with PowerDirector, WinDVD, Le Mans 24 Hours, Codename: Outbreak, Ballistics, two demo CD's and of course the driver CD. The accompanying user manual is a bit on the "thin" side but it relays the message quite clearly. Even with all the above features the Prolink GeForceFX 5600 Ultimate Golden Limited 256MB videocard retails for just $250 CDN ($185 US), placing it in the middle of the GeForceFX 5600 pack, and making it an awesome value to consumers. On a side note, we had a hard time getting the Prolink GeForceFX 5600 to work well with our Granite Bay/P4 2.8 GHz processor test system. The driver would install but we'd always get a "not enough resources" error in device manager. At first we thought that the card was defective, but we saw the exact same error with two other GeForceFX 5600's from different manufacturers. After some frustrating troubleshooting, we found that if DMA transfer mode on the HDD's was disabled the videocards would work flawlessly. With it enabled and the videocard simply refused to work properly.